I hope you all had a good, restful weekend! Have you been practicing the Meeting Place this week? What has He been saying to you? I would suggest that you keep a journal and write down the things that the Lord says to you. It can often be very encouraging to go back and re-read the things the Lord has spoken to you and over you. Especially when you find yourself in the midst of the battle or the storm. I hope you are all doing well today! Since this is our off week, we’ll be doing some devotions. The idea is to take the next week to think and pray over our topic and come to growth group next week ready to share (if you feel comfortable doing so) what the Lord has been showing you. Mike left for Bangalore early in the morning to help with the basketball camps. Theresa and I spent time at STEPS with Isaac, Tara, and Dr. Nisha. 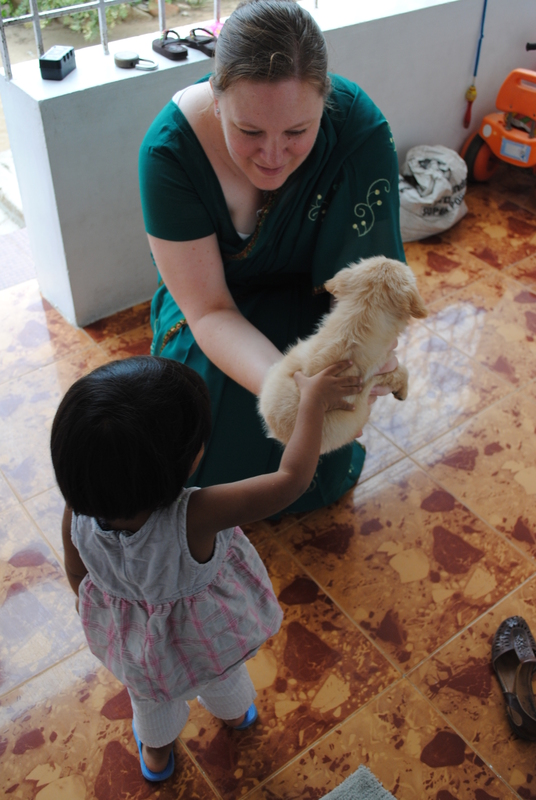 They had a meeting with the STEPS staff, and we (along with Ben and Rohan) hung out with little Angel. She was the only girl who hadn’t met little Buster, so we introduced her to the cute little guy. She thoroughly enjoyed getting to meet Buster! After their meeting, Isaac told us of his new small group Bible study he would be taking us to that night. He, Tara, and another couple were the leaders of a new 20-something group from church. He told me that they were going to be starting their study of Romans, but since he hadn’t had time to prepare, he was going to “Indian Outsource” the introduction of the book of Romans to me! Oh dear! Good thing the Lord has had me reading through Romans while I’ve been here!